It’s nice to have music in the shop. This device was made to turn a wall into a speaker, by fastening it behind a wall to the wallboard. The round pads on the ends of the legs are glued to the wall, and the middle section is like the middle of a speaker, minus the cone, and presses against the wallboard, vibrating it. This is the way sound is invisibly produced for museum displays. 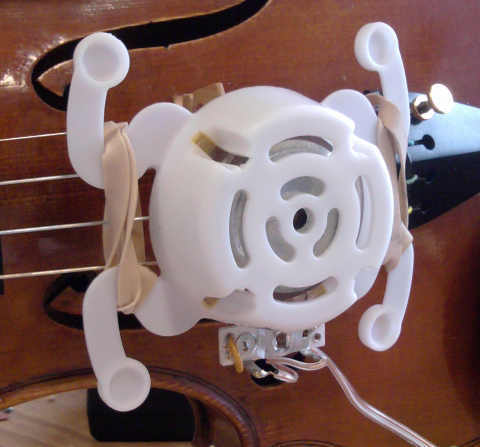 Violins will work instead of walls, but as with speakers, if you need some bass, you need a larger thing to vibrate. A cello will add that to the mix. Supposedly this kind of artificial playing is supposed to help break in a new instrument, but I haven’t noticed any improvement from this particular method, which is one of several things I’ve tried for aging tone without the musician’s input. This one’s interesting mainly because of its lack of great age: it’s from 1944, made in Hamburg, Germany; not a time and place you see many violins from. Usually I would associate this type of mud-crack surface with a soft varnish that’s been overcoated with something much harder (violating the painter’s fat over lean rule), where expansion and contraction of the softer underlayer has caused the over coat to break up gracelessly the way ice breaks up on water, but I’m pretty sure this particular violin has nothing over the original varnish. 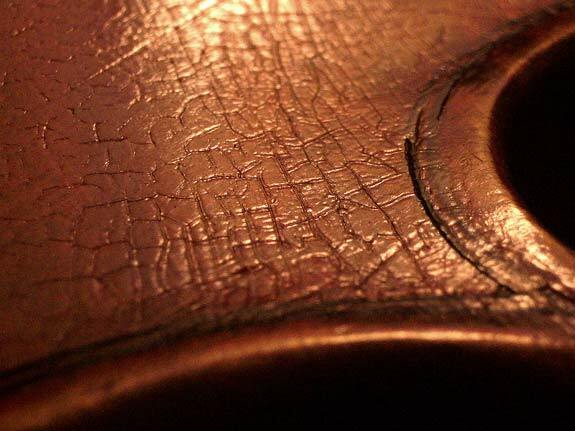 In real life the surface of this violin looks leathery; it’s an attractive surface, but better in some places than others. Nevertheless, the whole effect is positive on a violin of a type that you’d normally see polished up like a bowling ball. This is one of those things that I’ve always wondered about: how fast does wood darken, and how? 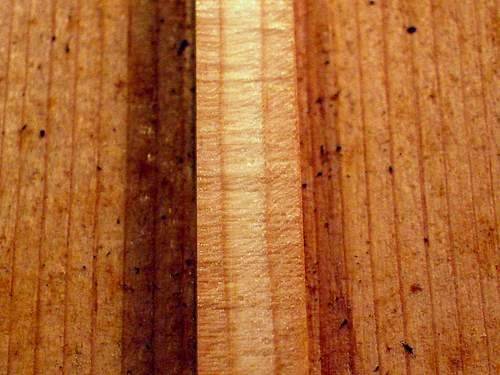 The central stripe here, with three grains of wood, is a bass bar in a violin made in 1941. I had cut it halfway down (it was being replaced) and noticed that the soft grains to the outside were darkened, but the central grain retained some of its original brightness. The hard grain lines on either side of the central one limited it’s exposure to air, preventing the central section from darkening!